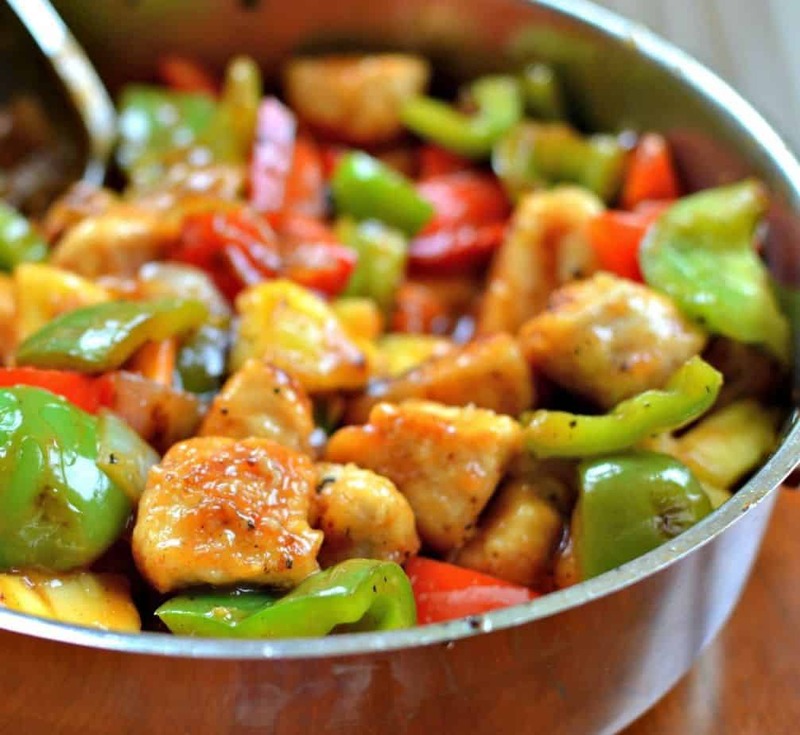 This scrumptious Sweet and Sour Chicken Recipe is sure to become one of your favorite recipes. It only requires one large skillet and does not require any deep frying. The chicken has a nice mellow crunch to it and is moist and tender on the inside. The sauce is not overly sweet which is perfect for bringing out the natural sweetness of the onions and peppers. I add just a couple pinches of crushed red pepper which balances the sweetness of the pineapple perfectly and adds just a touch of pizzazz. In a small saucepan combine the pineapple juice, water, vinegar, soy sauce, brown sugar, ketchup and cornstarch. On low heat simmer until slightly thickened. Cover sauce and remove from the heat. In large Ziploc bag combine the chicken and cornstarch. Shake the bag until well coated. Heat the vegetable oil in a large skillet over medium high heat. Add the chicken shaking any excess cornstarch off the chicken. Cook until nicely browned on all sides. Remove the chicken to a plate while you cook the vegetables. Add a little bit of oil to skillet over medium high heat. Cook the onions and peppers until slightly tender. Reduce the heat to low and the add chicken back to pan with peppers and onions. Add the sauce, pineapple, crushed red pepper and salt to taste. Gently stir to combine and heat until warmed. Serve over cooked rice or Chinese noodles. Why recipes using fresh pineapple do not make good leftovers. Everyone loves fresh pineapple. It is so incredibly delicious. Have you ever made a recipe with fresh pineapple and chicken or pork, packed the leftovers in the fridge with the intent of enjoying the meal a second time? After all it was so delicious. Instead you pull it out, nuke it in the microwave, put it in your mouth and the texture is awful. It looked good and it smelled good but something weird happened to your meal. Pineapple contains the enzyme bromelain, which breaks down protein. This is perfect for a short term marinade but not so great sitting right next to the chicken in the gladware container. The ending result is like mush meat. That does mean that you should cooking with fresh pineapple. Just adjust accordingly knowing that you should cook just what you will consume for that meal. This beautiful recipe is chock full of healthy bell peppers. Bell peppers are low in calories! So, even if you eat one full cup of them, you get just about 45 calories. One cup of bell peppers will give you more than your daily quota of Vitamin A and C! The capsaicin in bell peppers has a host of health benefits. Studies show that it controls diabetes, eases inflammation and reduces “bad” cholesterol. Helpful hints on making this Sweet and Sour Chicken Recipe epic. Cut your chicken into small bite size pieces so that they cook all way through when browned. Cook the sweet and sour sauce until it is slightly thickened as it will thicken more upon cooling. Use fresh bell peppers and when seasonably possible fresh pineapple. This dish should be served immediately so the chicken and peppers remain a little crunchy and crisp. Therefore do not mix it all together until you are ready to eat. I love pineapple but it can quickly overpower this dish so don’t get carried away. If using fresh pineapple be aware that it contains the enzyme bromelain, which breaks down protein. Hence this recipe makes an awesome first meal but it is not good for leftovers. Plan accordingly and if necessary make a half recipe. 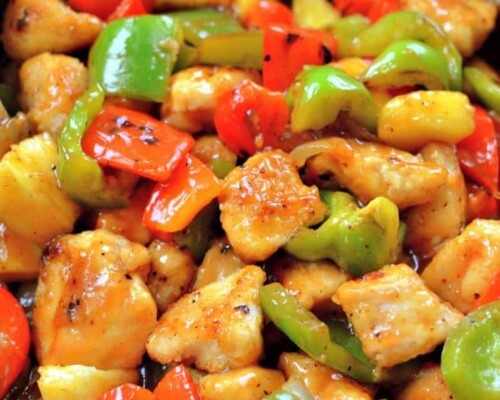 You can pull this Sweet and Sour Chicken Recipe together in about 30 minutes including prep time. It is a wonderful dish all by itself but you can serve it over rice or Chinese noodles. Chicken is just do darn versatile. It is on our menu at least twice a week. Great one pot dinners are awesome and this one tastes like a million bucks. What more could you ask for? Put the ingredients for this Sweet and Sour Chicken Recipe on your shopping list today and your loved ones will be singing your praises. Here are some more tasty chicken recipes to sink your teeth into!! This post was originally published June 27, 2016 and was republished November 12, 2018 with new content. 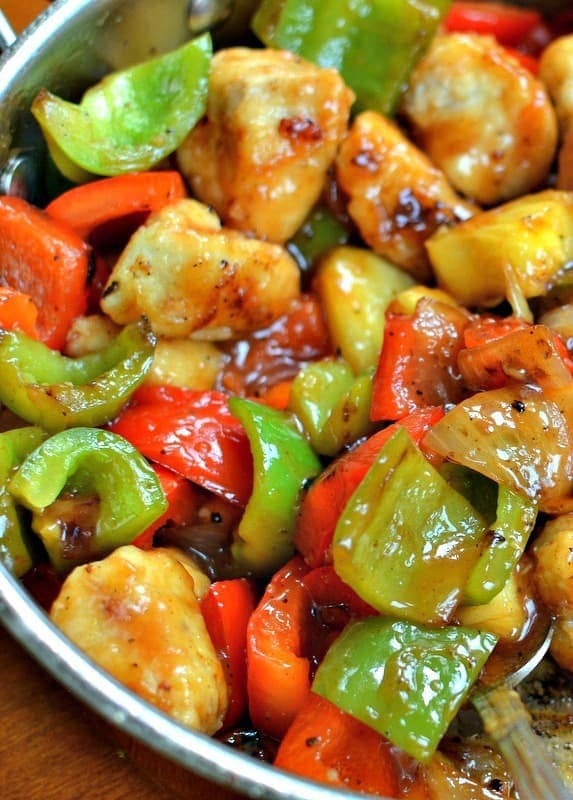 You can pull this Sweet and Sour chicken together in about 30 minutes. It is a tasty dish all by itself but you can serve it over rice or Chinese noodles. In small saucepan combine pineapple juice, water, vinegar, soy sauce, brown sugar, ketchup and 1 tablespoon cornstarch. On low heat simmer until thickened; whisking frequently. Cover and remove from heat. In large Ziploc bag combine chicken and 1/3 cup cornstarch. Shake until coated. Heat vegetable oil in large skillet over medium high heat. Add chicken; shaking any access cornstarch off the chicken. Cook until nicely browned on all sides and cooked through; about 4-5 minutes. Reduce heat if needed so chicken does not over brown or stick to the pan. Remove chicken to plate. Add 1 tablespoon of oil to skillet over medium high heat. Add onion and cook for 1-2 minutes. Add peppers to skillet and cook for additional 2-3 minutes stirring frequently. Reduce heat to low; add chicken back to pan with peppers and onions and cook for 1 minute. Add sauce to skillet, pineapple, red pepper and salt to taste. Gently stir to combine and heat until warmed. Serve over cooked rice or Chinese noodles. Made this a few times now very good and easy to make my family loves it! So glad that you and your family like it. I have to make that one soon. I have not made it in a while. Can canned pineapple be used instead of fresh? Yes Winnie you sure can. I love this homemade version WAY better than anything from a restaurant. Thanks for sharing! Brilliant post. You had me at the first photo! Love how you’ve broken this down into really easy steps, and the tips are great too. I didn’t know pineapple wasn’t good reheated! Thanks Helen! I am glad that you liked the post! 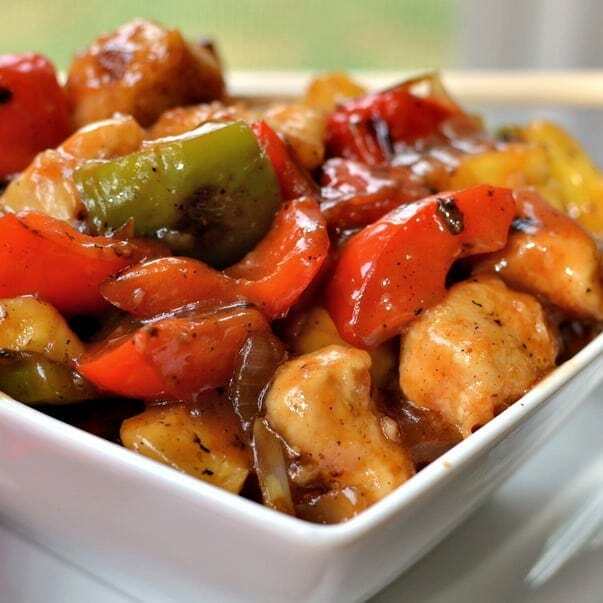 Sweet and sour chicken is one of my go-to’s when we order takeout. I can’t wait to make it at home. Homemade is always better. I’ve never considered this dish being made from home but it looks so easy! I may have to add it to my list of easy recipes because 30 minutes is a wonderful cooking time! My other half loves sweet and sour but normally goes for duck, I am going to have to try making him this and see what he thinks of it as well. Awesome Sarah! I think that he will love it! My husband would love this dish. I will have to surprise him with it! 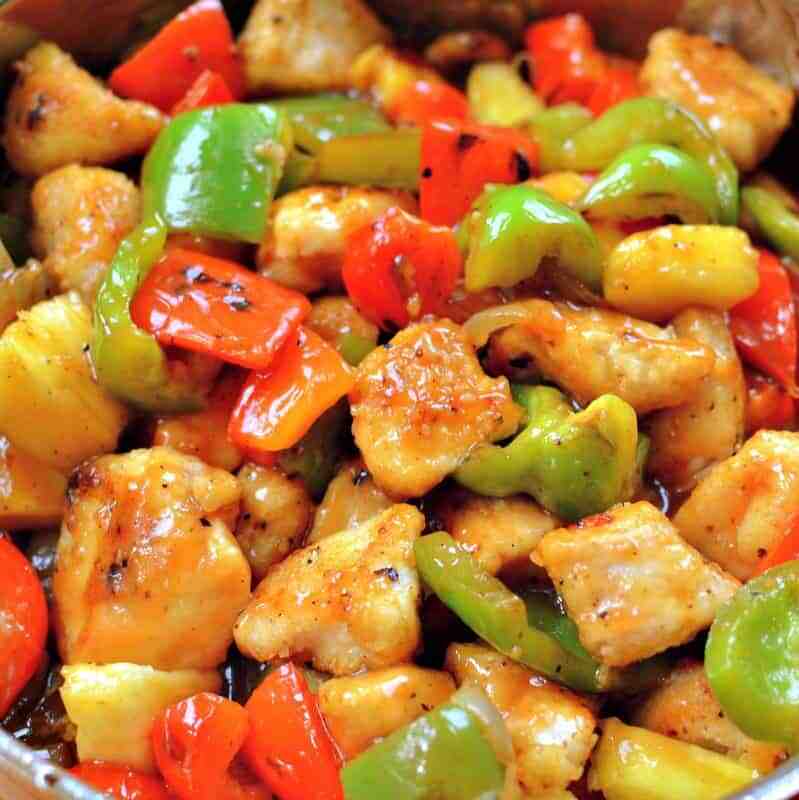 I like sweet and sour chicken and have tried different variations. I’ll try yours as well. I used to work at P.F. Chang’s, and this was my favorite dish to eat during lunch! Yours looks even better than the restaurant version; can’t wait to try this! Sweet and Sour chicken has been one of my fabe dishes! I should let you try my version. I know this recipe is yummy too! Ooh that is a killer recipe. One of my favorite Chinese dishes is sweet and sour chicken. My hubby loves orange chicken he would love this recipe! Awesome! You should make it for him! Our family loves Sweet and Sour Chicken! I would love to try making this sometime. This is one of my favorite meals. I have never really attempted it at home before but I definitely can now! Can’t beat a good copycat recipe for Chinese take out! One of our favorite busy weeknight meals! Delicious! This looks like an amazing dinner to add to our weekly rotation! I love how flavorful and tender the chicken turned out. YUM! My go to recipe when craving takeout!